Proton Pump Inhibitors - Acid Reflux Drugs: Are They EFFECTIVE? Proton pump inhibitors (PPIs) are a group of acid reflux drugs that decrease the amount of hydrochloric acid produced by the cells of the stomach. Doctors prescribe proton pump inhibitors to treat people with acid reflux (GERD), ulcers in the stomach or intestine, or other digestive disorders that may cause excess stomach acid. The stomach produces acid to breakdown food so it is easier to digest. The acid in the stomach is produced by the "hydrogen-potassium-AIPase enzyme system" or "the proton pump". The proton pump is a molecule in the parietal cells of the stomach that pumps acid into the stomach. The action of the pump is to take out a non-acidic potassium ion from the stomach and replace it with an acidic hydrogen ion. This hydrogen ion is what makes the stomach environment acidic. Proton pump inhibitors stop the action of the pump thereby stopping the acid secretion into the stomach. Their high efficiency and long duration of acid inhibition make PPIs a drug of choice in the treatment of acid-related diseases. All PPIs are similar in their mode of action and there is no evidence that one is more effective than the other. However, they differ in how they are broken down by the liver and how they interact with other medications. Also, the effects of some PPIs may last longer than others, and they can be taken less frequently. Generally, PPIs are well-absorbed by the body and provide quick relief of heartburn. Most people can tolerate PPIs very well, but some may experience side effects such as constipation, diarrhea, flatulence, headaches, nausea, abdominal pain, and vomiting. They are contraindicated in patients with hepatic disease, during pregnancy, and breast-feeding mothers. They also interfere with the action of drugs such as warfarin, digoxin, methotrexate, antifungals, and oral contraceptives. PPIs have been shown to increase the risk of hip fractures in patients above 50 years. The increase in incidence of Clostridium difficile infections as well as pneumonia is also associated with PPIs. While the efficacy of proton pump inhibitors in treating acid reflux has been proved beyond doubt, they cannot be used for more than eight weeks at a time. Additionally, they merely take care of the symptoms which reappear once the drug is withdrawn. 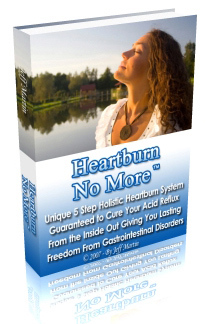 The only way to get completely cured of acid reflux disease is through holistic therapy. Acid reflux is a lifestyle disease so modifications of dietary habits, behavioral therapy, stress relief, weight management, are all very essential. Holistic medicine takes care of all aspects of the body treating it as a whole to get rid of the disease.